Bake at for 45-90 minutes. 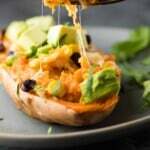 Mash together the sweet potato filling with enchilada sauce, salt, chili powder and cumin. Stir in the beans, corn and ¾ cup cheese, and spoon gently back into the skins.